The NATO summit in Chicago lacked the political resolve and commitment needed to adequately respond to the challenges ahead. The transfer of responsibility of governance from NATO to the Afghan authorities and the respective timing is increasingly dominated by unilateral decisions based on domestic electorate confidence and the tensions between Russia and NATO about the European Missile Defense System most vividly exemplify the lack of common ground and misinterpretation. This is especially worrying against the background of widespread military budget cuts and the call for "smart defense" which so heavily relies on close and trustful cooperation. The NATO summit May 2012 in Chicago – hometown of US President Barack Obama – does not fit into the category of “great summits” with fundamental decisions for the future of NATO. It was primarily part of the re-election campaign of Barack Obama including nice photo shootings with about 50 heads of states. The recently inaugurated Russian President, Vladimir Putin, was conspicuously absent – a symbol of current NATO-Russia relations. For “The Economist May 26th 2012” the “meeting was dominated by the need to unite behind plans for an orderly retreat from Afghanistan – more politely labeled as a transition to Afghan responsibility for the country’s own security” and “But finding a respectable exit from the ten year conflict against the Taliban and its allies has become the over-riding priority." There are two phases defined: the first phase until the end of 2014 and the second phase from 2015 to 2025. It was a strategic political mistake to call the end of 2014 as officiall date for the end of the ongoing combat phase. The insurgents can play a tricky game. They can reduce their attacks to accelerate the exit of ISAF troops. It would have been more prudent to define clear “criteria for success” answering the question what aims and objectives have to be achieved to allow an orchestrated phased withdrawal based upon NATO commanders’ assessment in the country. If and when ISAF troops leave too early the Taliban might come back again and destroy all achievements reached so far – e.g. in the education of girls. Many ISAF and Afghan soldiers as well as civilians would have died and wounded for nothing. The original plan following the slogan “together in- together out” has been challenged and changed by unilaterally declared different time lines. Looking at the electorate at home, whose majority is in general against any further commitment in Afghanistan, many political leaders decided to go for a quicker national exit to win or regain voters. Most prominent is the decision of the French President Francois Hollande to take French combat troops out of Afghanistan until the end of 2012. NATO nations grudgingly accepted this decision at the summit. The decisive catchword is “combat troops”. There is no clear cut separation between combat and combat support troops and training formations. Hollande declared in Chicago that some French troops will stay in Afghanistan beyond 2012 for support and training missions. Those troops which train Afghan combat troops remain close to combat. NATO nations - well experienced in achieving compromises – did not blame France for its solo run. They declared that the security standards in France’s area of responsibility allow the retreat of combat troops. It would not come as a surprise if other countries were to follow this path prior to 2014 – irrespective of what has been stated in Chicago. During the summit NATO authorities declared that in May 2012 already 50 percent of Afghan people lived under Afghan governance and up to 75 percent by the end of 2012. The remaining 25 percent will come under Afghan governance by the middle of 2013. That leaves 18 months to stabilize Afghanistan until the end of 2014 – backed by reduced ISAF combat troops. At the end of 2014 the ISAF mission will come to an end. The following politico-military operations will get another mandate and another name – underlining the different character of the mission from 2015 to 2025. It is no question that this money is not enough to fill the economic gap caused by the withdrawal of more than 100.000 ISAF troops and the loss of thousands of jobs for local people. The UN and EU are responsible for economic and human aid. The UN and EU should sign a long-term partnership agreement with Afghanistan. Both should also strengthen the Afghan police force, which is quantitively and qualitatively lagging behind the Afghan military. The stakeholders of a stable Afghanistan from Russia via Pakistan and India to China should step up pursuing their own vital national interests. NATO will continue to train, advise and assist, and support Afghan forces as they grow stronger. Based upon the strategic agreement between USA and Afghanistan, USA will stay with about 20.000 soldiers in Afghanistan. NATO nations have so far agreed to stay with about 2.000 soldiers. Against an ongoing threat by insurgents NATO’s and nations’ Special Forces could and should play an important role in close cooperation with drone units. The way ahead to the end of 2014 and beyond will need the political resolve of NATO nations and their partners. History will show us, whether the withdrawal of ISAF troops was on time – or too early. An early exit would constitute a hard blow for NATO nations and their allies. As mentioned before Vladimir Putin refrained from joining the G8 talks in Camp David and the NATO summit in Chicago. While he sent his Prime Minister Dmitry Medvedev to Camp David he decided for Chicago on the policy of an “empty chair”. The bone of contention between NATO and Russia has been the European Missile Defense System. Prior to the summit Vladimir Putin and his “Joint Chief of Staff” Nikolai Makarow delivered a warning to NATO. In a rhetoric which was colder than in the coldest days of the “Cold War” they threatened NATO with a “first nuclear strike” against the infrastructure of the missile defense system – explicitly against radar and interceptor systems located in Poland and Romania. For this purpose Russia wants to station Iskander missiles in the Kaliningrad Oblast. For many years NATO tried to inform Russia about the purpose of the Missile Defense System which is aimed to defend parts of Europe against a nuclear attack from Iran or from another rogue state or from a terrorist group. The information makes evident that the Missile Defense System is not aimed at Russia or its strategic nuclear weapons. The Anti-Missile missiles of the system are technically not capable to protect Europe against Russian Intercontinental Strategic Missiles. NATO nations seem unimpressed by Russia’s rhetoric and declared the “interim capabilitiy” of the system – in a phase adaptive approach putting already existing and future systems under one organization and label. Turkey, Spain, Romania and Poland have agreed to host key U.S. assets. The Netherlands will upgrade its radar systems. It would “a shot in the foot” by Russia if the Iskander missiles would be stationed in Kaliningrad Oblast. NATO nations would be forced to build a defense system against this threat from the East. Such a system would have an impact on Russia’s strategic nuclear potential. A new arms race in this sector would be counterproductive for Russia. There was a second NATO announcement which embarrassed Russia: It was the announcement that NATO aircrafts would air patrol the space above the Baltic States. Russia has to realize that NATO nations are not willing to give in regarding both decisions – in spite of Russia’s rhetoric and the dramatic increase of its defense budget. NATO nations obviously take into account that Russia faces demographic problems and increasing tensions with China in the Fareast and with the Islamists in the South. NATO nations face a much more dangerous enemy: the decrease in defense spending. The global financial and economic crises over many years have had a negative impact on defense budget and troop strengths. The slogan is now: ”design to costs”. Secretary General of NATO, Anders Fogh Rasmussen, invented a new label ”smart defense”. His catchwords are “pooling and sharing”. Being a German soldier in the NATO alliance for about 40 years I can easily remember similar approaches. The catchwords were: “Burden sharing”, “Role Specialization”, “Division of labor” or “More bang for a buck” etc. You can fill a library with intelligent books elaborating on this topic. The result of a myriad of proposals is very modest. The formula for the problem is quite easy: Deeper Cooperation vs. national sovereignty. It is easy to recommend a “German tank for all NATO nations” or a “British frigate for NATO navies”. But to implement those proposals proved to be impossible. Look at the different calibers of the rifles in NATO nations. It seems to be an easy task to harmonize the calibers and the ammunition of small arms – not to talk about tanks. Little has happened. A special problem form the parliamentarian caveats. If one country gives up a special capability – e.g. minesweeping at sea – it must be sure that other countries take over this capability in peace and war time. But what happens if the parliament of the country which has taken over minesweeping says no in the “case of”? My country has taken out German officers out of the AWACS fleet “in case of”. 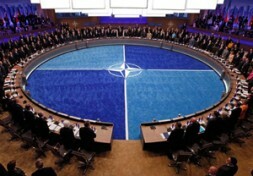 Only ten of 28 NATO nations joined the operation “Unified protector” against Gaddafi. As long as national parliaments refrain from accepting in advance “contingency plans” for defined operations so long “smart defense” for NATO remains without substance. NATO faces a new problem: The reduction of American Forces in and for Europe. This topic was missing on the official agenda. Which European nation is willing and able in a time of the “Euro crisis” to spend more money for defense purposes? The risks are there: Cyber power, international terrorism, Proliferation of Weapons of Mass Destruction, Energy Security, Transport security – just to name a few. There is a small chance that some NATO nations might increase their military cooperation on a bilateral basis. But those effects are very modest and limited. There is no choice: NATO nations have to gradually increase their defense budget to a minimum of 2 percent of the national GNP. It’s a question of responsible leadership and setting the right priorities. This resolve and commitment to future common security was missing at the NATO summit in Chicago in May 2012. NATO is on the road to a “Coalition of the Willing and Capable”.